The Adventures of Tom Sawyer, written by Mark Twain is one of America’s best loved novels of all time. This fascinating book combines enlightenment with enchantment on nearly every page. Prepare yourself for the experience of a lifetime as you set out to join the young Tom Sawyer in his exciting adventures! 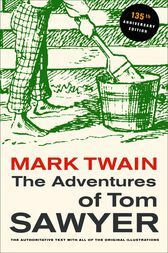 The book examines life through the eyes of the main character, Tom Sawyer, as he hunts for treasures, witnesses murders, plays tricks and gags on various people, travels down the river, and even runs away. The Adventures of Tom Sawyer is sure to make a delightful gift for children of all ages on your Christmas list this season. The timeless tales are certain to captivate any adventurous reader. This rare anniversary edition includes an exclusive selection of Mark Twain’s letters and notes about the book and its publication! Order your copy of The Adventures of Tom Sawyer today, and let the journey begin!